The two teams will lock horns in front of a sold-out Thomond Park. Munster will be hoping to avenge their 23-17 derby defeat to Leinster earlier in the season. THE ST STEPHEN’S Day Guinness Pro14 inter-pro between Munster and Leinster has now officially sold out, with Thomond Park’s capacity increased to meet the extra demand for tickets. Munster this morning confirmed all 26,267 tickets have been sold meaning the attendance for the derby fixture will be the highest-ever for a Pro12/Pro14 game at Thomond Park. It was announced earlier this month that additional seating had been installed in the north and south terraces to accommodate as many supporters as possible, with the now traditional Christmas fixture again garnering huge interest. 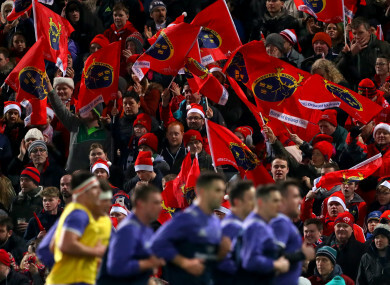 Both provinces come into the game — which marks the start of a busy Christmas and New Year period — off the back of back-to-back Champions Cup victories, while Munster are on a six-match winning streak in all competitions. Johann van Graan’s side sit second in Conference A of the Guinness Pro14 with seven victories from their opening 10 games, and will be hoping to avenge the 23-17 defeat they suffered to Leinster at the Aviva Stadium in round six. In keeping with previous seasons, the St Stephen’s Day inter-pro has also been designated as Munster’s ‘Charity Match’ and €1 from each match programme on the day will be donated to the Irish Heart Foundation. The game kicks off at 3.15pm and is live on TG4 and Sky Sports. Email “Sell out! Record crowd to watch Munster-Leinster St Stephen's Day clash ”. Feedback on “Sell out! Record crowd to watch Munster-Leinster St Stephen's Day clash ”.